With over a dozen frameworks available to build chatbots, competition is driving rapid innovation. The capability and reach of chatbots has ushered in many uses for their artificially intelligent deep learning processes. 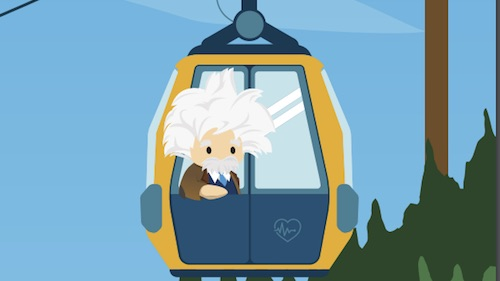 Given the advancements in processing power, chatbots now have the capability to interpret natural speech and learn from interactions with humans over time. However, these bots weren’t always so artificially intelligent. Remember how spammy those first Facebook Messenger bots were? “If bots are the new apps, we’re in for a bombardment of spam that could force you into blocking brands, bots, and services, if Facebook’s new chatbots are anything to go by,” Samuel Gibbs of The Guardian said in April of last year. You may have had a little spam with your queries like this one from CNN’s Facebook Messenger bot in the past . . . But alas, AI chatbots are now living up to their intelligent branding. In fact, there are a number of industry leaders eagerly hosting bots to meet customer needs. Facebook, Microsoft, Apple, and WeChat are just a few. The brands utilizing these new and improved chatbots are having unprecedented success. Brands large and small are using chatbot technology for conversational commerce, conversational advertising, customer service and support, and analytics. Facebook Messenger insights and analytics . . .
As bots learn over time, so do the companies and developers that unleash them onto mobile messenger platforms. Here’s how improved chatbot technology is refining sales and customer service and support for brands large and small in nearly every industry. The nature of deep learning chatbot technology is in many ways perfect for customer service and support. Building layers within their neural networks, they are able to tend to most customer needs quickly and accurately. Often faster than humans, customer service bots deliver timely support and lighten tasks of employees and service reps. This boosts brand satisfaction, and also influences buying decisions. One of the first brands to utilize Facebook Messenger chatbot technology was Hyatt. From day one, they developed their bots to be nothing but robotic customer service reps. The Hyatt bot can have real-time conversations with customers, ensuring the best user experience possible. Uber is another fantastic example of the improved chatbot technology revolutionizing how brands interact with their customers. Going to meet friends for lunch and need a ride? There used to be an app for that. But now Uber users can do it via Facebook Messenger. Within a conversation, users can use the menu to get an Uber. They can request a ride, track its location, and even pay via chatbot technology. Chatbot technology can be a brand’s most impactful sales representative too. Sales chatbots can bond with customers, often better than humans. How? They have layers upon layers of customer purchase patterns in their neural networks, allowing them to make timely, tailored recommendations. And chatbots can process payments too. “Customers can check out with a few easy clicks, without ever leaving the Messenger app,” Facebook announced in a press release. H&M, an apparel brand, uses chatbot technology to make sales absolutely seamless. Bots greet customers via Kik messenger and ask a series of clever buyer funnel questions. Using the answers to their advantage, H&M bots guide users to virtual checkout counters by making product recommendations based on unique style preferences. “Every time a bot interacts with a customer, it files away that person’s unique preferences, buying decisions, etc,” Refine.ai explained. “Whether consumers are looking for outfit inspiration or are debating trying out a new style, they can browse potential options by chatting with H&M on Kik as if they had a personal stylist at their fingertips,” TOPBOTS said. Even high-end fashion brands are using improved chatbot technology to make online sales. Spring is one online retailer leveraging Facebook Messenger as their digital concierge. In an effort to recreate the luxury shopping experience online, brands are using chatbots to drive purchases. Spring’s sales bot is a personal shopping assistant available via Messenger, guiding customers toward purchases using a series of multiple-choice questions. Spring chatbots also have touch points with customers after purchases. They also serve up virtual receipts, as well as tracking items during delivery. This is a concierge service important to luxury brands like Balenciaga, Givenchy. Catering to the needs of customers is certainly what the latest chatbot technology is all about. Brands want to be found, and apps may be losing ground to chatbots in this aspect. “The bot revival is also taking place at a time when people are growing tired of individual apps,” Mike Isaac of The New York Times said. 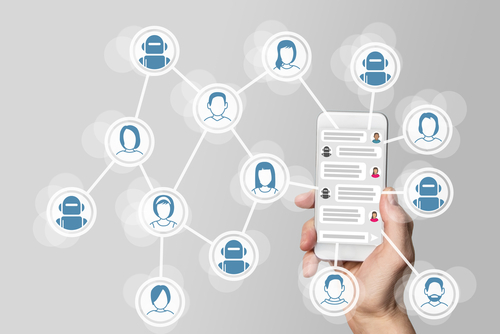 Branded chatbots are one way industry leading companies are refining the user experience in order to meet the demands of consumers. Facebook recently brought chatbot technology to group chat. Revealed at the F8 conference in April, these group Messenger chatbots keep users up to date on trending news, sports, and e-commerce, among other bot worthy notifications. These groupie chatbots will essentially “provide a viral growth mechanism,” Josh Constine of TechCrunch said. Instead of a Messenger user having to type in a specific bot name, one user in a group can add a bot to a thread, giving everyone access. Banking bots are indicators of the improved chatbot technology we are privy to today. Capital One for example, launched Eno, a Messenger bot that is the first natural language SMS bot from a U.S. bank. “That means you’ll be able to ask Eno to check your account and card balances, pay bills, and get other account and card history and info,” Jordan Kahn of 9to5Mac explains. You can get a wealth of banking information from Eno, including account balance, payment history, recent transactions, and more. You can even pay bills and transfer money with this new banking bot. Eno goes further than the chatbots of the past, recognizing emojis that users can use instead of typing. For instance, a money bag emoji tells Eno that you want a summary of your bank account. And a thumbs up emoji tells Eno to process a payment. Brands have been scrambling to get a bot of their own ever since Facebook announced the release of their Messenger chatbots. Despite the challenges of the past, chatbot technology has improved and at an astounding rate. It has been just over a year since the spammy bots were showcase after F8 2016. However, their innovative journey is certainly an indicator of their rising dominance in sales and customer service.